The Mackie 402VLZ4 4-Channel Ultra-Compact Mixer features Onyx microphone preamps in an ultra-compact design and is suitable for professional low-input applications. From every input to every output, the mixer is designed to provide the highest headroom and lowest noise possible for maximum signal integrity. The mixer is built like a tank with a rugged solid-steel chassis and high-contrast controls for discernible tactile control. With features like instrument level inputs, phantom power, and level metering, the 402VLZ4 4-Channel Ultra-Compact Mixer is a good choice for anybody who is big on performance, but light on inputs. The bottom panel of the mixer features has three non-threaded holes that allow it to be fitted with an optional microphone stand adapter (sold separately). This lets you support the mixer on a standard microphone stand and adjust its height and level to whatever suits your preferences. Box Dimensions (LxWxH) 12.6 x 9.0 x 4.3"
402VLZ4 4-Channel Ultra-Compact Mixer is rated 4.5 out of 5 by 13. Rated 4 out of 5 by Bill from I wish I had purchased another one already! 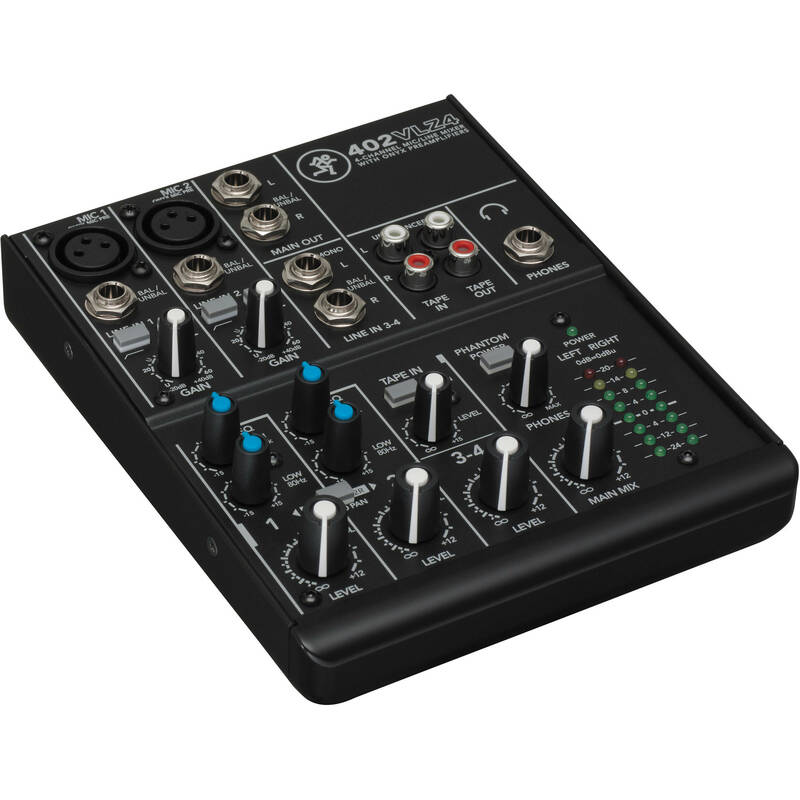 The mixer is the usually high quality heavy duty Mackie product. I needed phantom power to run condenser microphones, and this is doing the job just fine via the switching power supply-wall wart. This is stand mounted by the musician. The outputs go to my FOH mixer and the headphone jack feeds the musicians earpiece in mono. The violinist can adjust her monitor volume via the headphone POT without affecting the line out volumes. Way cheaper and more foolproof than any 2 mic wireless system and lets musician run their own monitor. Rated 5 out of 5 by Will from Great for desktop computer use I use this to take the audio from my editing computer and split to my desktop monitors and headphones.? It works perfectly and has a tiny footprint on my desk - exactly what I needed. Also great to pack up and take into the field for small audio jobs. Rated 5 out of 5 by Alik from Mackie 402 I'm new to mixer , but it work excellent , very well build metall construction , I really like it a lot , I needed fantom power for microphone , it does great , I'm happy with this probuc and recommend to anyone ! Rated 4 out of 5 by Jesse from Works for me!! I use this for my editing suite. My editing machine, laptop and system audio all come through this and go out my main speakers. Works great.It kid of stinks that all the connectors are different and you have to switch to use one of them, but that's not enough for me to pass this by. Rated 5 out of 5 by on the road musician from Lightweight, good tone This mixer has a lot packed into a small space and is excellent construction and sound quality. I did a lot of research before choosing it. It accommodates two mics and two guitar cords. I'd highly recommend it. Rated 1 out of 5 by tech teacher from Be careful on what speakers you use it on Does not have enough output to drive our speakers in our open area. Works okay with smaller speakers. Rated 5 out of 5 by Emmanuel from I will refer product to a friend True portability for a small group meeting. Just hook it up with pa speakers & good to go! Love it! How does this get connected to the computer? Connect the Main Outs or the Tape Out to the line in on the computer. are headphone levels independent of main levels? Hello, and yes. There is a Headphone Level knob that works independently of what the actual audio output is. I use this small portable mixer to tweak my audio that much better, as opposed to playing with audio in Post Production. This was a great investment for me since I get better audio while recording it. This mixer is quality built. Is the power supply truly universal? The user manual appears to list different power requirements for different models depending on where it is purchased. The Mackie 402VLZ4 ships with an external power supply, and is packaged regionally. The power supply available with units purchased from B&amp;H are 100-120 VAC compatible only. Can I plug in a line level input from a mixing board?